Christmas is almost here and I am completely unprepared. Okay, that’s not entirely true. I’m like 92% unprepared. Back in October I ordered three Christmas gifts. This week I ordered 2 gift cards. My house and tree are decorated. But I still have more gifts to get and my mixer is broken. Well, out of commission. If there is ever an absolute worst time for your Kitchenaid Mixer to go on the injury list, it’s around the holidays. My aunt lent me her mixer, but it’s basically a dinosaur compared to a Kitchenaid. It’s basically a hand mixer that attaches to a stand so it’s called a stand mixer. Can I tell you how much I miss my beater blade? Anyway. 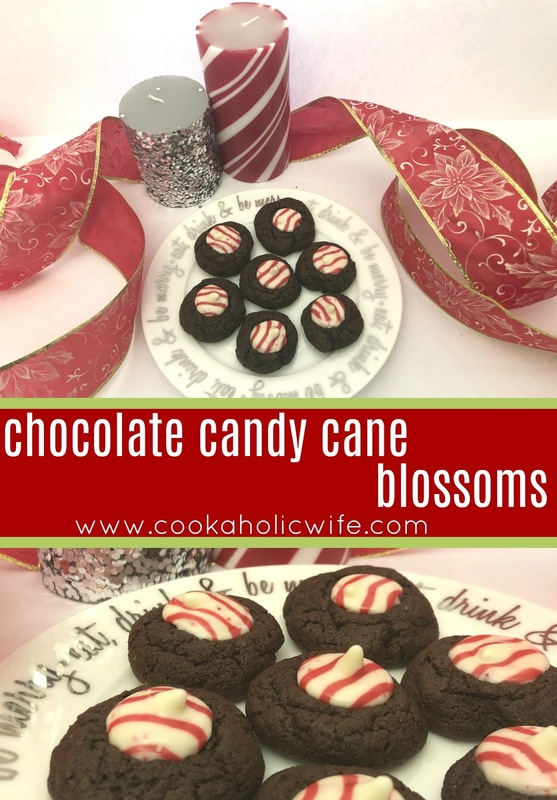 The last recipe that my Kitchenaid churned out before the locking mechanism failed was these chocolate candy cane blossom cookies. 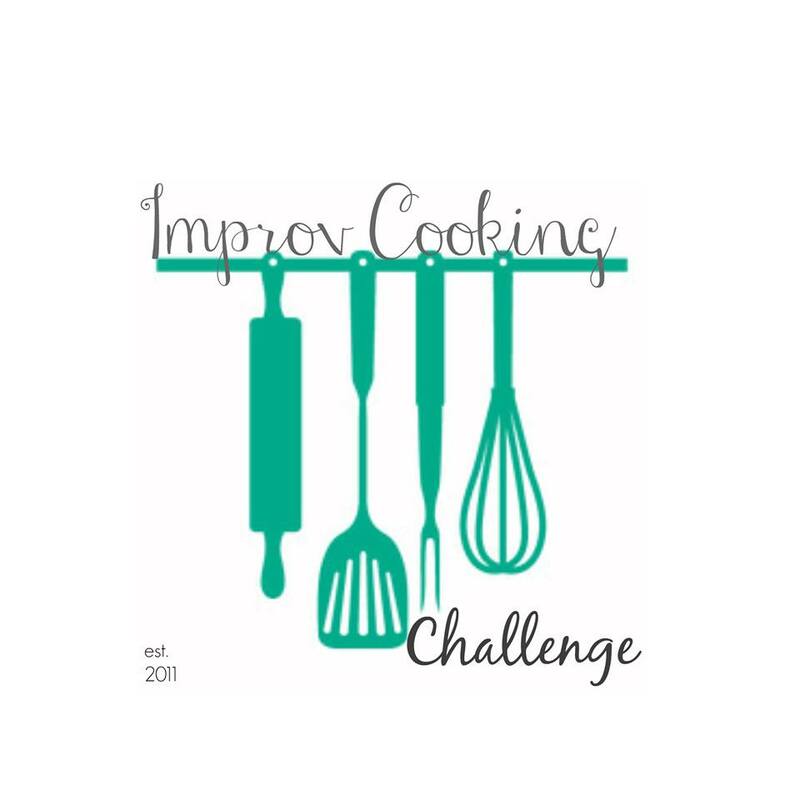 It’s time for the Improv Cooking Challenge again and our theme for December is Chocolate and Peppermint. As I may have mentioned every.single.holiday.season, I absolutely love peppermint. I probably looked at close to 100 recipes before finally deciding to make these cookies (1) because I had all of the ingredients (2) because they’re easy to make and (3) because I knew they’d be gone in a few hours once I took them to work. Chocolate and peppermint lovers will go gaga for these chocolate sugar cookies topped with a peppermint candy. Preheat the oven 350 degrees. Line two large baking sheets with parchment paper or Silpats. In the bowl of a stand mixer, add the butter, sugar and brown sugar and beat on medium speed until fully combined. Meanwhile, whisk together the flour, cocoa powder, baking soda, baking powder and salt together in a medium bowl. Add the egg to the stand mixer, allowing it to become fully incorporated before adding the vanilla and mint extracts. Slowly add the flour mixture into the mixer, mixing until a soft dough forms. Refrigerate dough for 10 minutes. 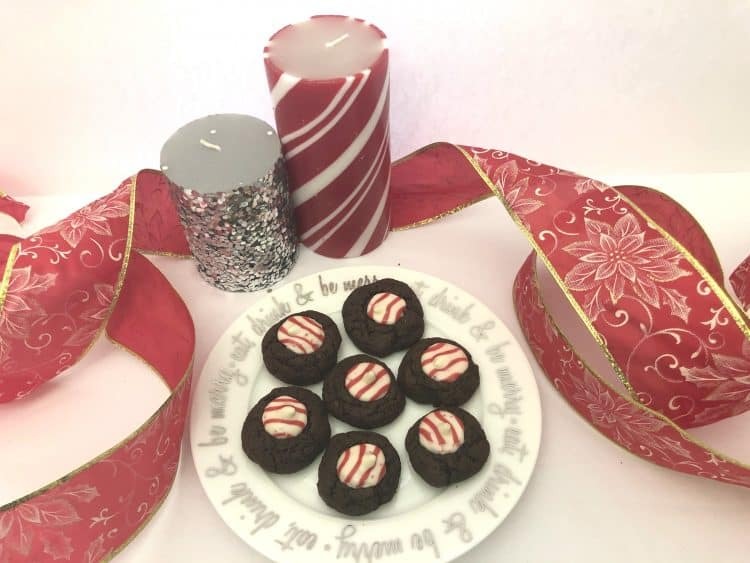 In the meantime, unwrap the Candy Cane Kiss candies. 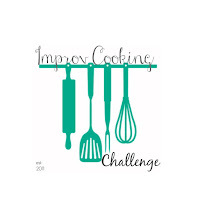 Remove the dough from the refrigerator and roll into 1 inch balls, placing on the prepared baking sheet. Bake for 8-10 minutes or until just set. 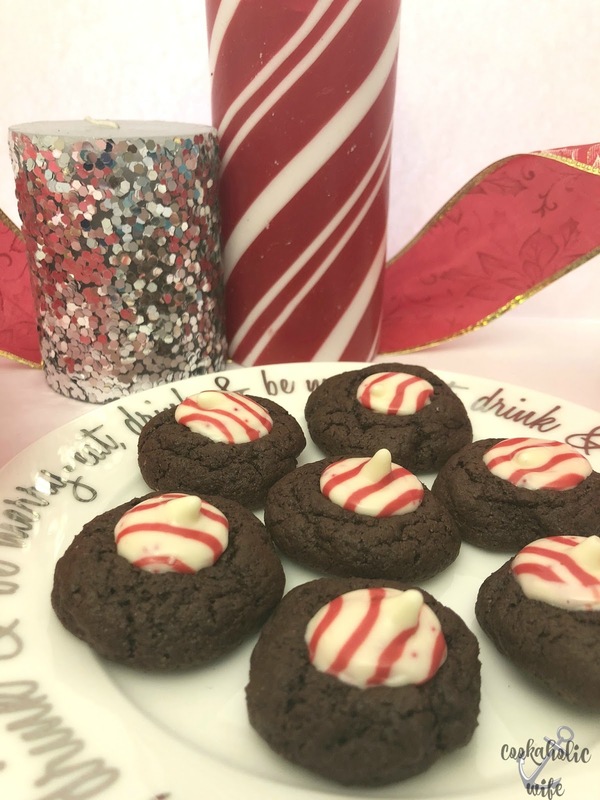 Remove from the oven and allow to cool on the baking sheet for 1 minute before placing the Candy Cane Kiss in the center of the cookie. Cool 2-3 minutes more before transferring the cookies to a wire rack to finish cooling. I’ve never had the candy cane kisses melt quite as much as they did on these cookies. I tried letting the cookie cool longer before placing the kiss in the center, but then the cookies ended up cracking and I decided melted kisses looked better than cracked cookies. If you tinker with this recipe and get them to not melt, let me know your secret! As expected, these were gone before lunch time when I took them into work.